SILVER SPRING, MD – The Montgomery County Council will hold a public hearing on Tuesday, February 12, 2019 at 7:30 p.m. in its Third Floor Hearing Room (100 Maryland Avenue, Rockville, MD) for the MARC Rail Communities Sector Plan for the station areas in Boyds and Germantown. Community residents and the public are invited to testify at the hearing. They must sign up online by 10 a.m. on February 12 to testify. View the Planning Board Draft of the MARC Rail Communities Sector Plan. 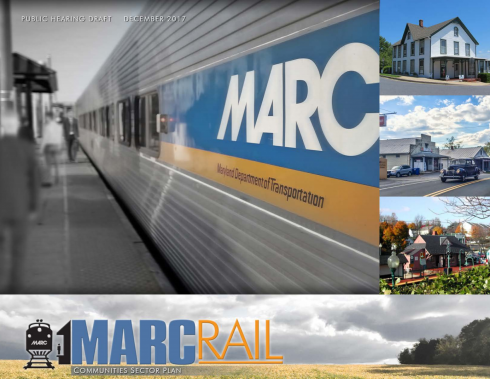 The MARC Rail Communities Plan, launched in 2016 and approved by the Planning Board in 2018, evaluates land use, zoning, design and access conditions at the Maryland Area Regional Commuter (MARC) stations in Boyds and Germantown. The plan builds on the recommendations of the previous 1985 Boyds Master Plan, 1989 Germantown Master Plan and 2009 Germantown Employment Area Sector Plan. Connect the Boyds and Germantown station areas to their respective communities, while ensuring a viable range of transportation choices. Recommendations include reducing dependency on cars and vehicles for all daily station trips by improving the pedestrian and bicycle environments, expanding public transportation options and managing roadways to minimize traffic backups and congestion. Renew the Boyds and Germantown station areas by encouraging adaptive reuse of existing structures and design of infill projects that reflect the scale and character of their historic surroundings. Sensitively expand commuter parking areas in ways that support historic districts and create streetscapes that enrich community identities. Preserve the historic character of Boyds and Germantown and interpret the shared history and historic resources of the communities to strengthen their identity and sense of place. Ensure future development and transportation improvements are compatible with the historic settings to maintain their integrity. Sustain the area’s natural assets by protecting and enhancing tree canopy and water resources and adapting the built environment to manage storm water runoff. Celebrate the area’s distinctive setting while managing infrastructure and utilities to support community character and public health. Development of the MARC Rail Communities Sector Plan relied on extensive public outreach, including an intensive four-day design workshop in Germantown and a number of community meetings designed to solicit the views, concerns and suggestions of affected residents, businesspeople and other stakeholders.